A big happy hello and welcome for those of you visiting from the Blogger's Quilt Festival! In the proper spirit of the Festival - here are some additional details about my New Wave Quilt which I present for the first time ever. When I first started purchasing fabric to make "something" I was not confident in my fabric selection so I was a big fan of the fat quarter bundles. Honestly I'm not sure how this one made it into my shopping cart because I do NOT like green. Anyway, I bought it and placed it in the "I'll make this into something someday" pile. This pile is otherwise known as "something will jump out and say "make me" and this fabric will come dancing along behind it" And then....when I get to working on some projects, I get tired of them and just need a break so no matter what I am working on, I stop. Then I peruse my craft room and my patterns and jump into a new project, that isn't on the list. Does that happen to you? So one day....I just started cutting into this, just to do something else. The original bundle of fabrics had a light green and a whimsical print, that I was not so fond of, so I posted and asked my blog readers for some input and thanks to them, made a couple of substitutions. The idea that just a dozen fat quarters can be cut and made into something so neat makes me really love this pattern. I stitched this up for a fun throw with no other purpose then to cuddle up - so on that front - mission accomplished! Thanks for stopping by and enjoy the many many other entries in the Blogger's Quilt Festival and many thanks to Amy and the wonderful sponsors for this event! Very pretty - great colour choices! I love these colors! Adorable quilt! Great quilt!! The colors and the quilting are just perfect! Love all of those fabrics! This is beautiful. I like the colors you chose. Also, thanks for stopping by my blog for my day on the Let's Get Acquainted Blog Hop. Oh I think it looks lovely! Beautiful quilt and you made a great choice in your fabric selection! A fabulous quilt!! The different scale fabrics and colours look great. I totally understand those times of having to sew something else for a change. Don't like green huh? Well just out of curiosity, what is your favorite color? Oh and your quilt looks awesome! 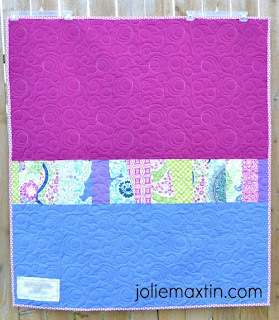 Hi There, I found you through the P and J Monday linkup, and wow this quilt is just amazing! I love the colours you have used. That swirly quilting just sets it off perfectly too. This is lovely - very feminine! Your New Wave is gorgeous! I am not much of a big fan of green either, alone... but with blues and yellows I really like it. Thanks for stopping by my blog and reading all my TTT posts. :) I'm a happy new follower! Snuggly - just because I can - quilts are the best. I too love that you have made something really nice from just a few fat quarters. I have the same pile of stuff waiting to scream 'make me!' too! And what's funny is this exactly how my silent cinema new wave quilt came about... I was bored of my other project and my quilt store had a sale on 10 fat quarters so I bought them (I wasn't in love with all of the prints) but I was so excited I ran home and had the whole thing finished in a week. And I love them all put together! Your quilt looks great!